Product prices and availability are accurate as of 2019-04-20 14:57:31 EDT and are subject to change. Any price and availability information displayed on http://www.amazon.com/ at the time of purchase will apply to the purchase of this product. Q: Master, Krishna says, "My devotee never perishes." But if everything is God, what perishes really? Krishna makes it sound like the devotee does not perish and the rest do. Please explain and remove my doubt. A: Understand, the moment you realize that you do not perish, you become a devotee of Krishna. There are no categories like Krishna's devotees and others, or that Krishna's devotees will not perish while others will. Whoever understands that he will not perish becomes Krishna's devotee automatically. The moment you understand this concept, you become his Bhakta, his devotee. So, be very clear, if you understand that everything is God, then nothing perishes. Nithyananda talks on the 12th Chapter of the Gita, traditionally called Yoga of Devotion. He gives it the title, 'Love is Your Very Life' and explains how unconditional love to one another is the way to reach God. 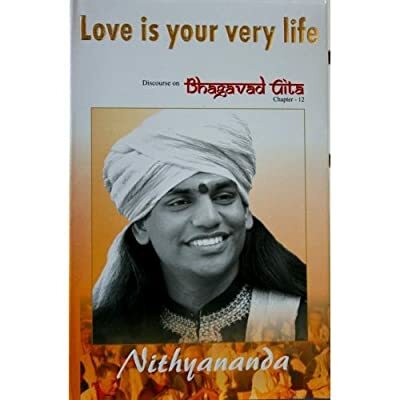 Nithyananda illustrates each verse in the chapter in his inimitable style. He presents his own experience of living the Gita everyday. He expounds on the subject of love and surrender, to make one understand that love is not an emotion, but a quality, the quality of the being, which if discovered can liberate one from all conditioning and lead to inner bliss. Says Nithyananda, "It is so easy to say that you love the world or you love God, but very difficult in practice to love your neighbor. Do not deceive yourself by saying claiming to love the whole world. If you cannot love another human being whom you meet everyday, how can you think of loving a God, whom you have never met?" Nithyananda awakens one to the power of love and surrender, thus paving the way for joyous liberation.